It wasn't until the climactic scene that I finally bought what Lauren Beukes is selling here. 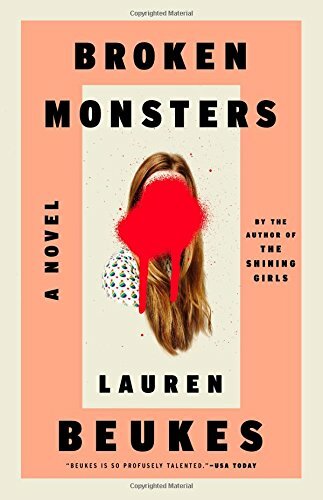 Broken Monsters is a solid thriller, sure, but for me the tough sell was the fantasy angle, the parts of the book that swerve into weird waking nightmare territory. Other reviewers have described this book over and over as “phantasmagoric”; I was starting to believe that maybe phantasms just aren't for me. Maybe I'm not phantastic enough for this particular kind of writing. Sometimes, though, you have to buckle up for the ride, trusting the author to make something amazing out of dubious-seeming spare parts. It helped that I'd already read and enjoyed Beukes's debut novel, The Shining Girls, so she had some built-in credibility with me to draw on. I decided to stick with her and see how (or if) she managed to bring these crazy strands together. And there's plenty of crazy going on. There's the fairly typical lady cop, Gabi Versado of Detroit PD, whose tough-as-nails approach counteracts the inevitable sexist barbs from her male colleagues. Gabi's daughter Layla is a teenage girl with typical teenage girl problems, although she proves to have the same sharp instincts and desire for justice as her mom. However, the players take a turn into left field when we encounter Jonno, a shamelessly opportunistic video blogger, and TK, a homeless guy who loots foreclosed houses and whose self-appointed higher power is a chair. Then, of course, there's the unhinged, potentially possessed serial killer who makes his “art” by joining his victims' corpses with the bodies of dead animals and other salvaged materials. But is he really responsible for his crimes, or is he just the vessel for something bigger and more terrifying than any one human could be? What finally made me a believer, and what makes this book better than just another solid thriller, is the clever and surprising way Beukes finds to comment on contemporary cultural issues. Broken Monsters is a murder mystery for the 21st century. It poses questions like: What is the driving force behind the evil in our world? What happens to it when we refuse to pay it the attention it craves? Is it possible anymore to keep one's private life private? Is there such a thing as privacy in an online world that has no off switch? So the fantastical elements aren't gratuitous. They're not included just to keep the story from being a garden-variety mystery. Beukes allows her characters to drift into a psychotic dreamscape because our world itself sometimes looks like a psychotic dreamscape, twisted beyond our recognition. Broken Monsters shows us we might still have a chance of putting it right.